One of the oddities of having been AWOL from the blogosphere is that when, as now, I want to refer back to a book I've reviewed as being one of my favourites from last year, I have to check myself and remember that I actually read it in 2013 (which seems eons ago now). 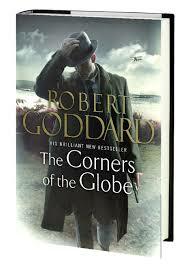 So, anyway, one of my favourite reads of 2013 was The Ways of the World by Robert Goddard, the first novel in a trilogy that follows James "Max" Maxted, a First World War veteran hunting down the killers of his father, a senior member of the British negotiating team at the Paris peace conference of 1919. If you haven't already read this excellent thriller, I hold warn you that the following may contain inadvertent spoilers. You have been warned. Max has concluded at the end of The Ways of the World that the secret of his father's death is held by the German spymaster, Fritz Lemmer, an elusive yet seemingly omniscient presence who, seemingly like Professor Moriarty, "sits motionless, like a spider in the centre of its web, but that web has a thousand radiations, and he knows well every quiver of each of them. He does little himself. He only plans. But his agents are numerous and splendidly organised." The Corners of the Globe opens with Max apparently working for Lemmer and being sent on a mission to Orkney to retrieve a top secret document from the interred German fleet. Having managed to get hold of the document, Max becomes a hunted man, as he tries to deliver the document not to Lemmer but to Appleby, his contact in Special Branch. Cue a 39 Steps style man hunt, full of narrow escapes, deaths and plenty of action, leading Max from the Highlands to Paris and beyond. And while Max is headed towards Paris, his friend and former batman, Sam, is already there, working as a driver for the British Embassy and getting caught up in a deadly power struggle within the Japanese delegation to the peace conference, a struggle that is directly linked to the murder of Max's father. As you can probably tell from the slightly convoluted synopsis (and from the fact I haven't really said too much about the plot for fear of spoilers), The Corners of the Globe is frenetically paced, chock a block with characters and multiple plot strands. In truth, despite Goddard's undoubted talent, he doesn't quite bring it off. Don't get me wrong. I did enjoy it and Goddard definitely keeps the pages turning. It just came across as very much the middle entry of a trilogy, a bit like The Two Towers (at least in my view and don't shout at me Tolkien obsessives - I love The Lord of the Rings as much as the next fantasy geek). There's a sense that it's purpose is to physically move the protagonists and the plot to their correct starting blocks for the final volume, almost as if the central plot is too much for two books but hasn't quite got the legs for three. Again, let me be clear. It's a perfectly good book and there are some fantastic scenes in it. It's just not as good as the previous book and I'm glad that I'd read that first - not only does it make this one much more comprehensible, the quality of the first kept my interest in this one going until the end. I'm not sure that would have been the case if I'd come to this one first. I have a couple of more specific gripes too - firstly, and I accept that this may be intentional (one of the characters is described as reading The 39 Steps and commenting that Max's adventures make it seem dull), the Buchanesque chase is just a tad too obvious and heavy-handed to avoid grating slightly. And secondly, the ending is gratuitously cliff-hangerish, much more melodramatic than necessary. But, and there's always a but, it worked, dammit. I can't wait to read the final volume (it's only my promise to Mrs F not to buy any more books for a while and my burgeoning TBR pile that has stopped me so far). On the other hand, Goddard's characterisations are great. Max's character is developing real depth as his physical journey into the world of espionage is also taking him on a mental journey, forcing him to develop a harder, more cynical outlook on the world. He kills an innocent person to protect his identity and feigns ignorance of a down on his luck former school friend - both things the Max of The Ways of the World would never have done. Overall? Well, I wanted to like it more than I did, whilst still liking the overall series well enough to really want to read the final volume. If you like spy stories or adventure stories or are interested in the historical period, it's definitely worth a read but do read the series in order. Finally, I'd like to thank Transworld publishers for allowing me access to The Corners of the Globe via NetGalley.